Georgian qvevri wine: if it’s good enough for God . . .
For Father Gerasim, whether to treat his wines with sulphur or any other additive isn’t a matter of choice. The imperative is simple. Any impurities in the finished product would render it unworthy in the eyes of God. Gerasim is the winemaker at the 11th Century Alaverdi monastery, a commanding, slightly austere complex with breathtaking views of the Caucasus mountains, located in Kakheti – Georgia’s most revered wine region. His core philosophy – “My only wish for wine is less interference in the winemaking” – chimes with non-interventionist winemakers around the globe. 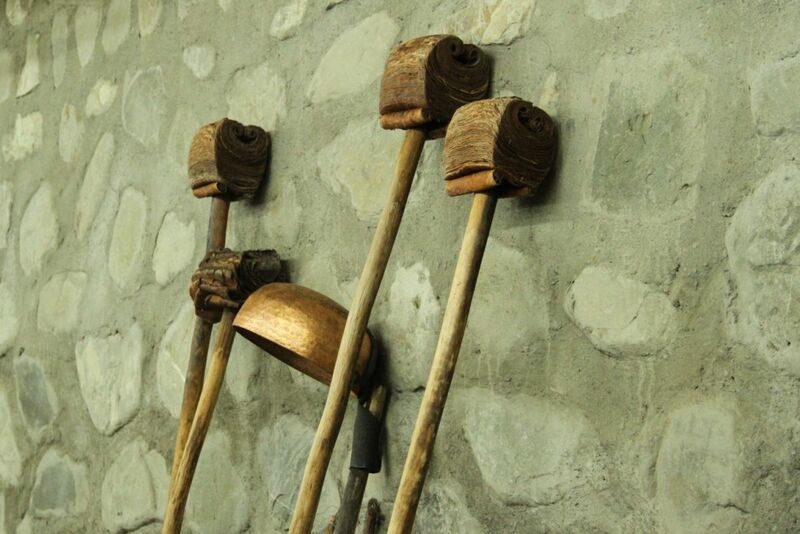 But Alaverdi has a traditional Kakhetian weapon in the arsenal which is capable of creating some of the world’s most individual and complex wines. The qvevri (or ქვევრი if you’re comfortable with Georgian script) is a large, clay Amphora-like vessel holding anything from 400 to 2,000 litres or more, traditionally buried in the ground up to its neck. Grapes are crushed and thrown in, together with skins, stalks and pips (called “the mother” in Kakheti), and fermentation is left to begin naturally (no cultured yeasts or nutrients are added). Red wines may be racked and separated from “the mother” after fermentation. The qvevri is then sealed with a wooden lid and earth or clay, and the wine is left to mature for up to six months. After this time, the qvevri is opened, to reveal the hoped-for transformation into a delicious, star-bright liquid. 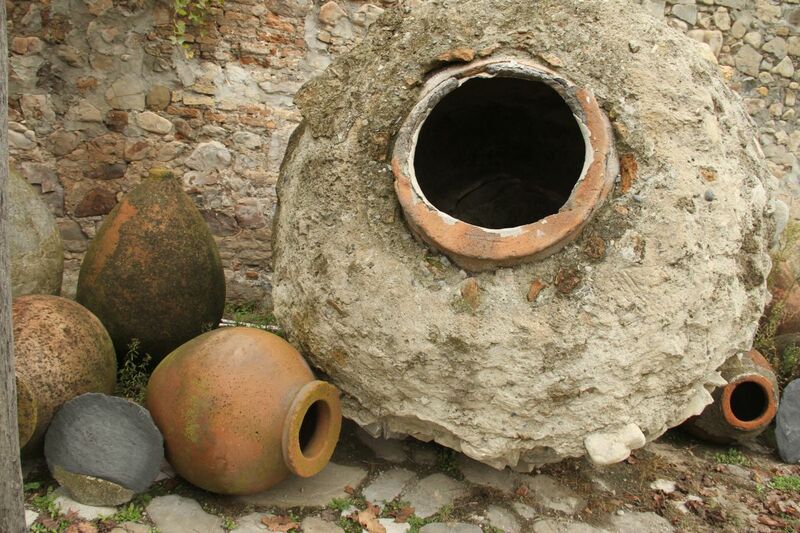 You might think that this laissez-faire production method would be prone to flaws – how hygienic is a clay amphora, and what about oxidation? Well, that’s the interesting part. The qvevri tradition can be dated back around 8,000 years, and its longevity and continued usage throughout the centuries is testament to its success. The sheer brilliance of the qvevri becomes more apparent, the more you discover its solution to almost every common winemaking fault and problem. Leaving the maturing wine resting not just on its skins and stalks, but also on the lees (dead yeast cells), certainly adds flavour and complexity – but the longer it’s left, the greater the risk of reductive (sulphurous) flavours and odours developing. However, in a qvevri all of the solid matter collects in the small conical bottom, minimising contact with the rest of the wine, and effectively preventing the development of reductive nastiness. 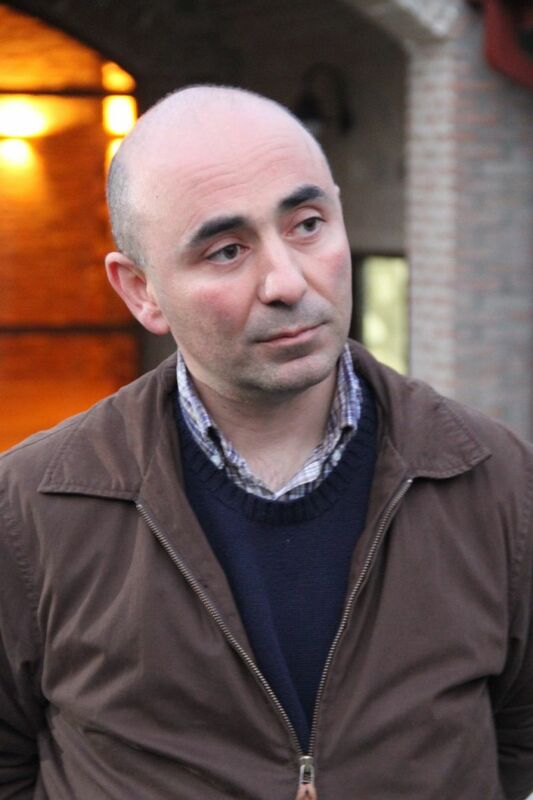 Giorgi “Gogi” Dakishvili, winemaker and managing director at German-owned Schuchmann Wines in Kisiskhevi, comes from generations of Kakhetian vignerons. He points out that qvevri wines achieve their stability (not refermenting in the bottle, or turning into cloudy cider) partly due to the plentiful mono-proteins released from the lees. He is also keen to stress that letting qvevri wines (whether white or red) go naturally through malolactic fermentation is a key element in the stabilisation process. All of this is achieved without any form of additive, or manual intervention. For Gogi, making wine with qvevris is a far more interesting challenge than using conventional western methods. Schuchmann Wines produce both styles, but you can tell that Gogi’s heart lies with the qvevri wines, bottled under the Vinoterra label. Interestingly, Schuchmann also produces a “premium” oak-aged cuvée, “M1”, yet for me this wine has far less of the complexity and depth that defines the Vinoterra qvevri wines. Wine made without regular doses of sulphur dioxide is prey to all kinds of micro-bacterial activity, volatile acidity and spoilage yeasts like Brettanomyces. Hygiene is vital to prevent infection, and to ensure that a bad batch from one year does not affect the next. Qvevris must be scrupulously scrubbed after every vintage and are traditionally sealed internally with beeswax. Frank Cornellisen’s experiments with amphorae in Sicily proved that omitting this step caused big problems with volatile acidity levels. A well-honed tradition prevails. Modernist winemakers are often fanatical about temperature control – and again the qvevri has the answer, for this massive, thick-walled vessel, buried deep in the ground is excellent at moderating extremes of heat and cold both inside and out. That’s important as Kakhetian summer temperatures can soar to 40°C. Perhaps the biggest surprise with well-made qvevri wines is that they do not have a pronounced oxidised or oxidative character. Looking back at 50 or more tasting notes from a recent visit, not once did I write “sherry-like”, or use any other tell-tale descriptors. Yes, the aromas can be surprising and dense – cooked fruits, honey, jasmine, herbs and floral notes are all common in the whites – but they are quite distinct from deliberately oxidised styles like the Jura’s Vin Jaune or Chateau Musar Blanc. And what about the holy grail of natural winemaking? Many traditional Kakhetian red wines are made with no added SO2 whatsoever – the tannins from the skins and stems suffice as stabilisers. But even the monks at Alaverdi are pragmatic when it comes to white wines, and these are usually bottled with a small amount of sulphur to prevent oxidation. Just as well that only red wine is traditionally used for worship. Qvevri wines can be outstanding or clumsy, much like any style. The best examples (And I would unquestioningly list Alaverdi and Vinoterra amongst them) have refined, seductive tannins – just as well, as there are usually a lot of them. These wines are also fabulously complex, particularly on the nose. It’s best not to think of the white wines as, well, white. They are amber coloured, tannic, age-worthy and most at home with food – pork, chicken and cheese are all popular choices in Georgia. Worldwide interest in Georgia’s wines and production methods has been building for a decade, thanks in part to European pioneers like Josko Gravner and Frank Cornellisen, but is yet to peak. When the winery at Alaverdi monastery was rebuilt in 2005, there was no intention of exporting or selling wine, but now around 20,000 bottles are released onto the market every year, in recognition of the considerable interest in the style. 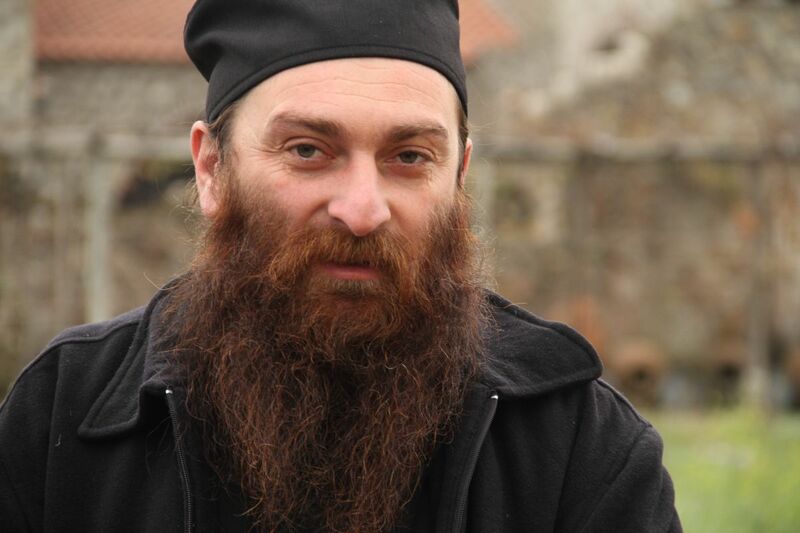 There doesn’t seem to be a conflict between this restrained commercialism and the monastery’s mission – Father Gerasim told us that the aim is merely to restore the monastery to the same levels of prosperity and self-sufficiency that it enjoyed in the 11th Century. And of course to produce wine that is as pure as humanly possible. I’ll raise a glass of Rkatsiteli to that. Simon Woolf writes about wine at http://themorningclaret.com. His article for Palate Press on winemaking in the Etna Region was awarded “best content” prize by the Etna Consorzio, at the 2012 EWBC conference, and listed as one of Palate Press’s top 10 articles of 2012.